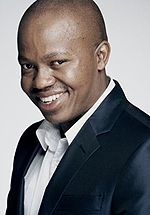 Tshepo Maseko is a South African actor best known for his starring role as Parsons Matabane in the SABC3 soap opera Isidingo. He was a celebrity contestant on the M-Net reality competition Survivor South Africa: Maldives, in 2011. He played the lead role of Nick in the 2005 short film Blow, written by Llewelyn Roderick and Portia Gumede, and in 2006 hosted the SABC2 game show Our Beautiful Country. He also hosted the eighth season of adult education reality show It's For Life, on SABC2, and starred in the short film The Ring, as twin brothers. In 2011 Tshepo was a judge on the ONE Gospel reality competition Shine. In 2012 he starred as Senior Constable Rapulane "Raps" Modisane in the SABC2 police drama series Streets of Mangaung. He also had a guest starring role in an episode of the SABC2 sitcom Skwizas. He joined the SABC2 religious music programme Gospel Classics as host of the second season, from 2012-2013, replacing Linda Sibiya. Maseko is fluent in North Sotho, Tswana, Zulu, South Sotho and English.